Crab fishing is a way of life for many of the people that reside in the small town of Conche, Newfoundland but that comes to a standstill when the harbour is filled with pack ice. When the ice melts, the boat is fully prepared and loaded with all the crab fishing equipment that the fisherman needs. 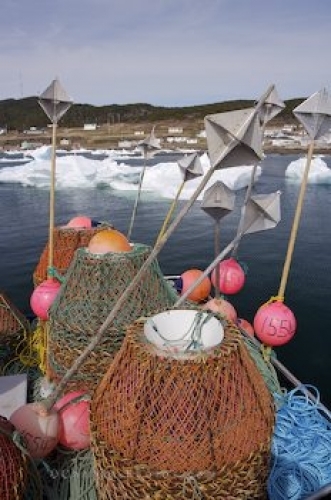 Picture of crab fishing equipment on a boat in Conche Harbour in Newfoundland, Canada.